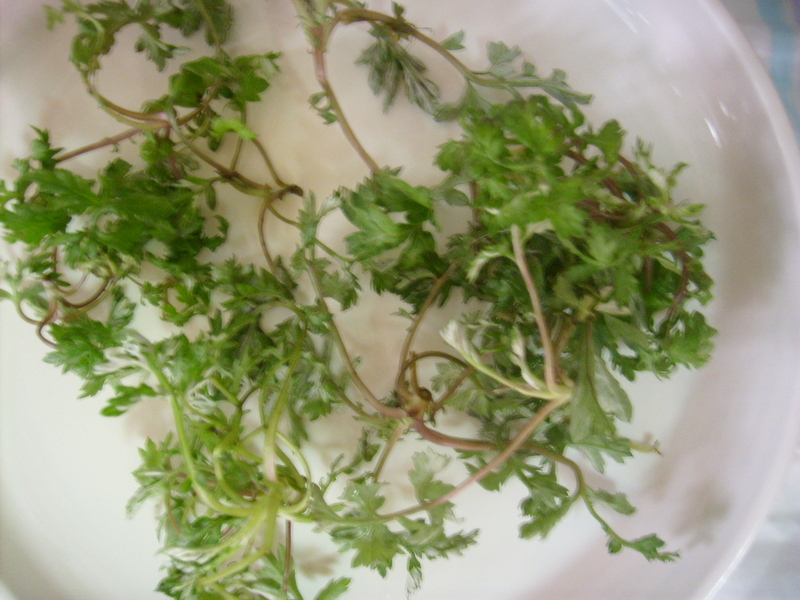 In the ebente-tang (이벤트 탕) last Thursday, the essence of the day was mugwort (쑥) which is a coincidence. This plant has a long and extensive history in both the east and west and being Spring, it is currently readily available in street markets and from the elderly women who sit on pavements with a small selection of vegetables. I bought a very large bagful for 2000Won (£1 sterling) which I washed, drained and put straight in the freezer. Now, to be honest, I’m not sure how it is used but a quick search revealed one use is in soups. Immediately, I added some to my bean paste soup (된장 찌개) which I was making for breakfast. Don’t be fooled into think I’m a health freak, I had a BHC fried chicken last night, with a complimentary bottle of cola! My initial reactions to the mugwort were good but I’ll need to try it again. Mugwort is also known as Felon Herb, Chrysanthemum Weed, Wild Wormwood, Old uncle Henry, Sailor’s Tobacco, Naughty Man, Old Man or St. John’s Plant. Korean uses it to colour some types of rice cake green and it is known as a blood cleanser. It is also used in the production of the small cigar shaped burners used in the oriental medical practice of moxibustion. The genus, artemisia, is extensive and one type, artemisia absinthiumm, is used in the production of absinthe, the oil of the plant giving this powerful drink, among other things, its rich green colour. Mugwort pillows, also known as dream pillows, basically a pillow slip filled with mugwort, can apparently induce vivid and even prophetic dreams. I’m skeptical when it comes to ‘crystal crap’ so in my trawling for information on various aspects of mugwort, I fell upon a youtube video by ‘New Age Goddess, Djuna Wojton,’ which was too good to ignore. Djuana is a typical Earth Mother eccentric who is both entertaining and somewhat charismatic, so you can try the link and learn how to make yourself a mugwort pillow – which I intend to do when the market is next in town.